Well, I am back from another unplanned blog hiatus. Friday was busy with a photo shoot, then prepping for the two shows I had this weekend, followed by an amazing comeback victory by the Cardinals (woo-hoo!). Saturday I was out in O'Fallon all day, then went to our friends' housewarming party. (Jessica, if you're reading this, your house is amazingly cute and I love your stylish eye!). 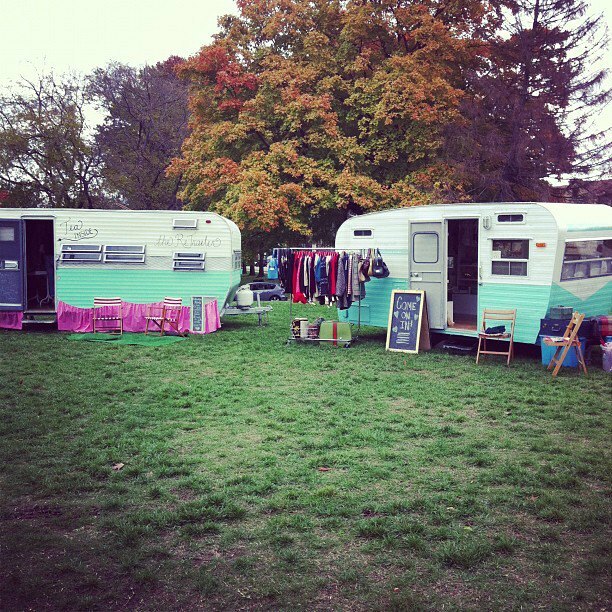 Then Sunday I got to participate in the Dutchtown Harvest Festival, which was a ton of fun! I got to meet some really passionate people, and Holly got to hang out with her buddy The ReTrailer. I mean, look how cute they are together! Last night the hubs and I watched the Redbirds...or I guess I should say the hubs, because I apparently passed out on the couch around the third inning and didn't wake up until the game was over (oops). So this morning I'm finally feeling rested after getting about 10 hours of sleep (heehee), and I'm SO excited to finally have another Style Spots post to share! 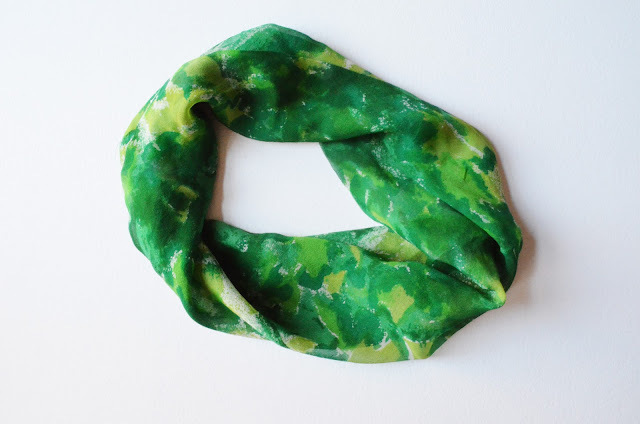 A green Vera scarf that's sewn together at the ends, but I can't tell if it was made that way or someone did it themselves? 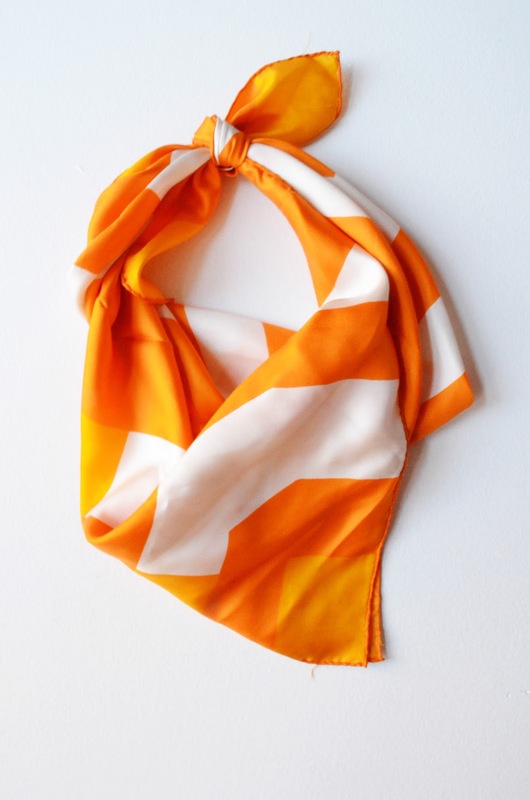 A really pretty orange-and-white Vera scarf. 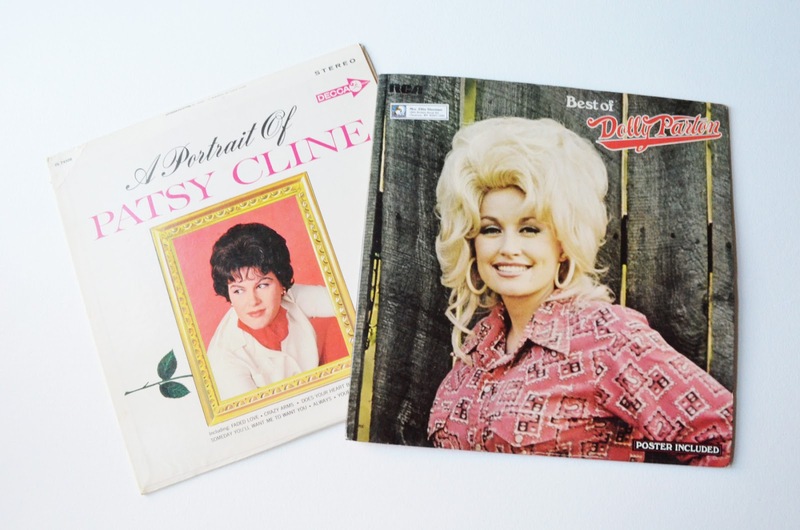 Two of my favorite country ladies: Patsy and Dolly. Found these albums in Cheyenne, Wyoming. 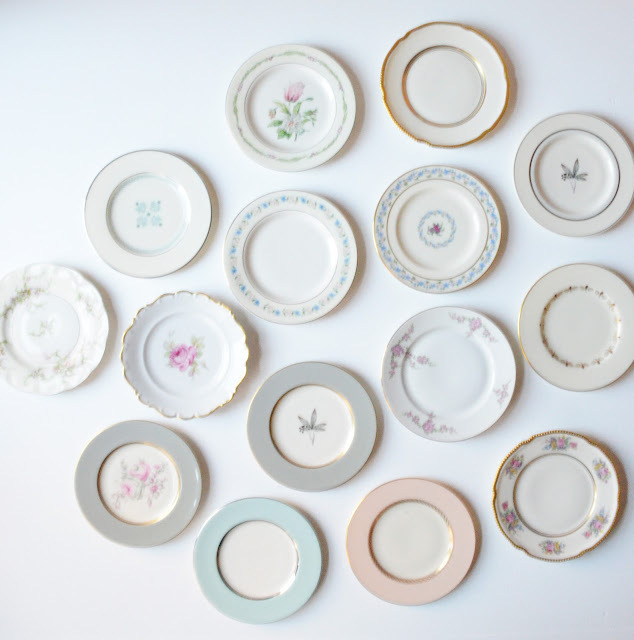 And a mismatched set of vintage dessert/app plates to use for the dessert/tea parties I hope to hold with Holly in the future. I love, love, love finding instant collections like this! How about you guys? How was your weekend, and did you score any goodies? Would love to hear about it! 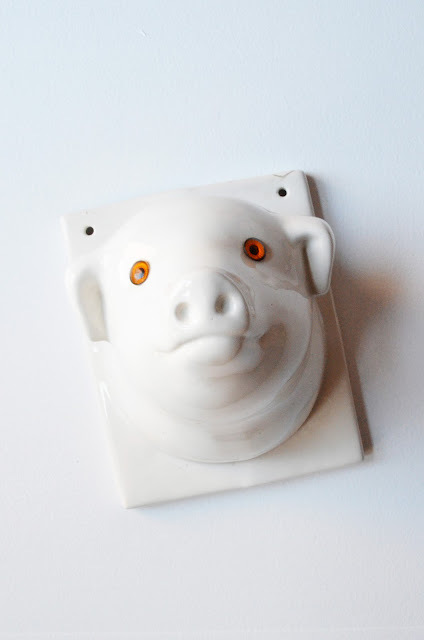 Oh wow I love the pig head!! There is some kind of a milk building in Chicago that has a similar cow head on the outside. This weekend I got a super cute carry-on size vintage American Tourister suitcase in light blue. It is in great shape, doesn't stink, and the previous owner left the original suitcase paper inside with the lock code written on it! $8! I also found some small plates and a platter in a pine cone pattern that I collect - yes! I am pretty sure I saw that pig's head myself and didn't buy it. I was all over the thrift stores in SLC last week, so I have this picture in my head of the two of us passing unbeknownst. Em's was a good choice, but if you ever come this way again and need vegetarian food recommendations, let me know! Oh my gosh, we very well might have! How funny! Well I guess thanks for leaving Figaro for me. :) And I'm sure we'll be back out there sometime. We both loved Salt Lake and Park City! And I will definitely take food recommendations! Where are your fav veg places around there? 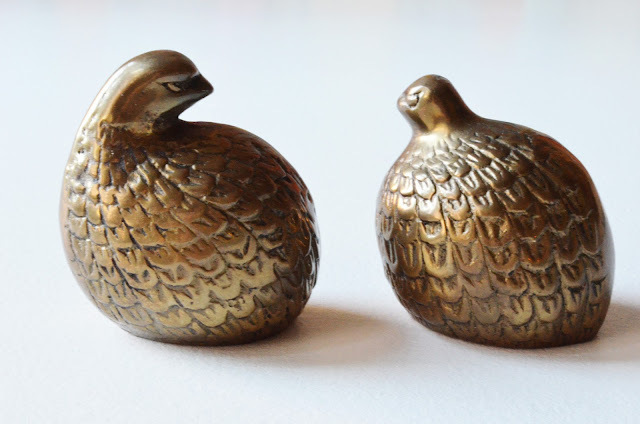 I am completely smitten with your blog - and I am spending entirely too much time today going back and reading "older posts", and more "older posts".....! You probably already know this by now, but I found a very similar Vera circle scarf at a thrift shop, and, if I recall correctly, I discovered (somewhere?) that it's called an infinity scarf. I bought it with the intention of selling it, but I like it so much I don't think I can part with it! Mine is green, also, but in a different pattern.